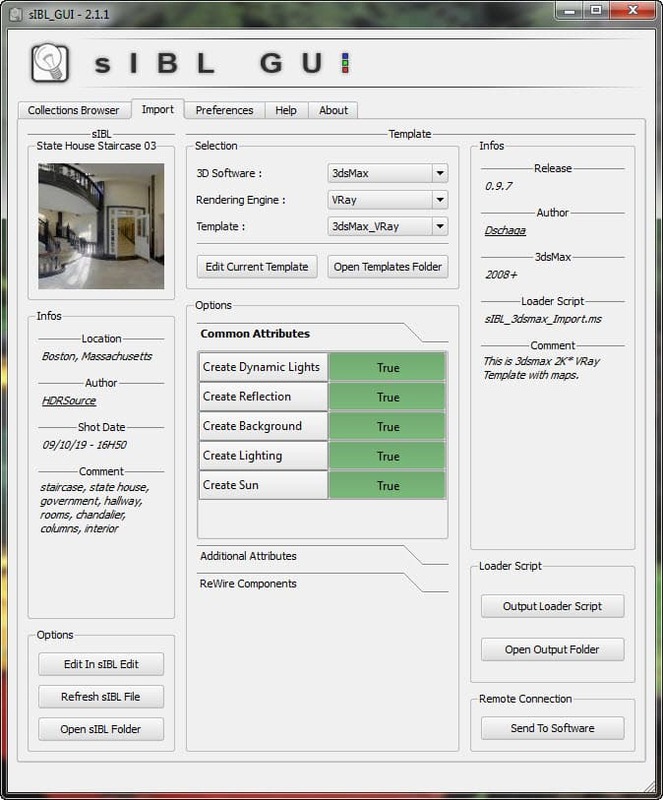 sIBL stands for Smart Image-Based Lighting. It’s a completely free stand-alone application written by 3D programmers and volunteers. sIBL helps organize HDR libraries and sends them to a 3D application for a quick and easy setup. sIBL Settings for Sending your HDR images to your 3D software. 1) sIBL is a great organizer of your HDR libraries. If you ever tried viewing a HDR library, you’ll know that it is difficult because of a general lack of thumbnail support. HDR files can also be very large in size. Loading each preview can take a very long time. 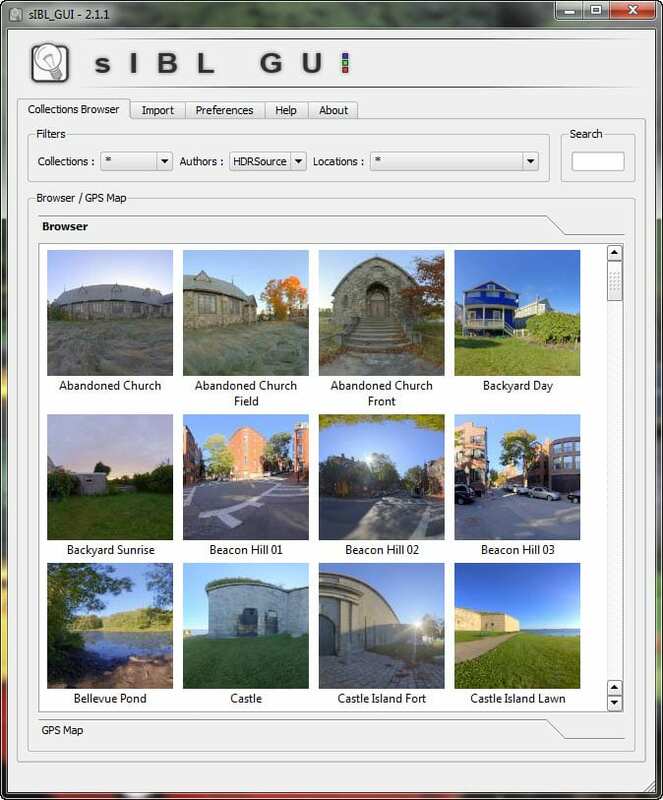 sIBL format reduces the HDR down in size and allows you to easily sort HDRs via location, time, keywords, author, and thumbnail previews. a) A thumbnail for a quick preview. b) A low-resolution blurred HDR for environmental lighting. c) A medium-sized non-blurred HDR for reflections and refraction. d) A tonemapped background image. This appears more correct than an unmodified HDR alone. This method is so effective that 80 MB HDRs can be consolidated down to roughly 20 MB instead. A jpeg thumbnail preview can be less than 100 KB making it extremely efficient to browse. 3) Obtain higher-quality 3D renderings. sIBL files are automatically preset for high-quality settings and optimal lighting conditions. 4) sIBL automatically adds a sun or multiple lights within your scene to match the location of light sources within your HDR environment and background. This gives you greater control over lighting and shadows. If you ever used a HDR by itself, they generally do not provide accurate and sharp shadows. Some HDRs may provide this directly but are “faked” into doing so. sIBL employs a “more correct” method of manually keying the light sources. 5) Ease of use (once installed.) You simply select the HDR preview in the browser window then “send” to the application of your choice. Most major 3D applications and third-party rendering plugins are supported. 2) 3D Studio Max with Mental Ray and VRay. Some support for Final Render and Brazil. 3) Maya with Mental Ray, RFM, Turtle, and Vray. Since the sIBL community is a volunteer group who program this in their spare-time, they are actively seeking additional volunteer coders that can help improve sIBL and add additional programs to its support list. Your participation and contributions to the community is welcome! How do I Set Up and Install sIBL? sIBL installation guide for 3D Studio Max. Similar steps may apply to your specific application.